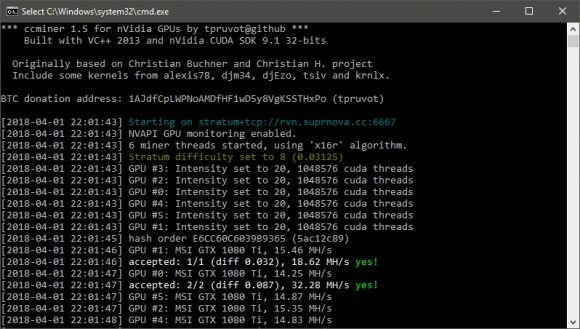 Ocminer, the admin of the Suprnova mining pools, has been pretty actively maintaining and further improving his supminer fork of ccminer (source) adding numerous performance improvements for the X16r and X16S mining algorithms. 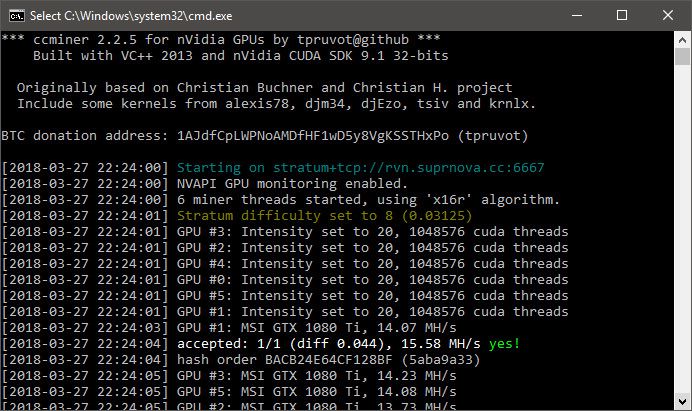 So if you are mining either Ravencoin (RVN) that uses the X16r algorithm or Pigeoncoin (PGN) that uses the X16S algorithm you might want to try the supminer or update it if you already use an older version than the latest 1.5. In the last two days there were numerous performance updates regarding various algorithms that are a part of the X16r and X16S, so supminer could as well be the fastest miner for RVN and PGN at the moment. The miner is free and open-source with a 32-bit Windows binary release also available compiled for CUDA 9.1 (require R390 or newer Nvidia video drivers). Another open-source fork of ccMiner called supminer (source) is now available, an optimized version from the operator of the Suprnova mining pools that promises up to 10% better performance than the recently released nevermore ccminer fork. 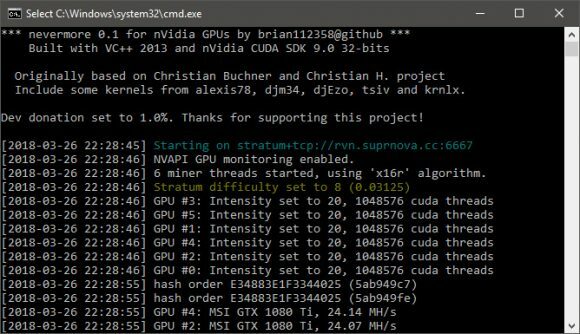 The supminer ccMiner fork comes with with no developer fee, but you can show your support by mining Ravencoin (RVN) on Suprnova’s RVNCoin Pool. 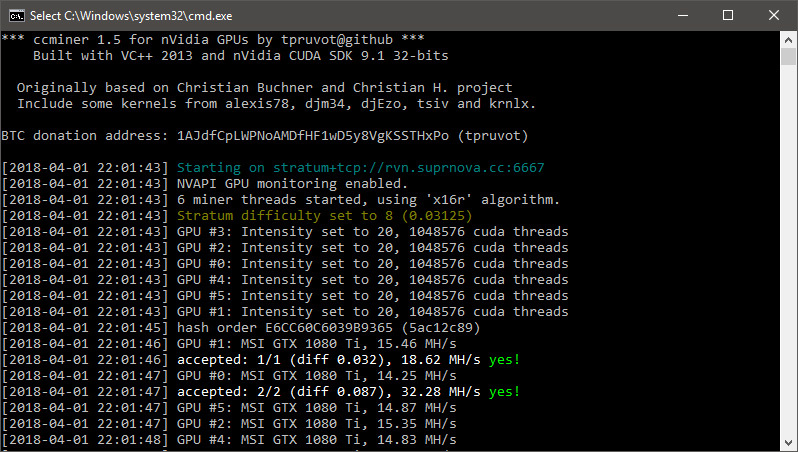 There is an official 32-bit Windows binary release available compiled with CUDA 9.1, so make sure you have up to date video drivers on your mining rigs. The code is compatible with Linux as well, though you will need to compile it yourself (make sure you have CUDA 9.1 installed to compile from source). In theory the supminer should be faster than the other available ccminer forks with X16r support, but you should test and compare the different releases and see what works and performs best on your hardware. Feel free to report hashrates and stability on your mining rigs and how supminer compares to the nevermore and enemy miners. When comparing hashrates make sure you compare on the same algorithm, because hashrate varies depending on the currently switched to algorithm. Do note that the performance optimizations should not work only on the X16r algorithm, but should also help improve performance on other chained algorithms supported by ccminer. There is now a new optimized open-source fork of ccminer with Ravencoin (RVN) X16r support called nevermore miner (source) that offers better stability compared to the initial ccMiner 2.2.5 with X16r support and similar performance to the closed source ccMiner Enemy 1.03 fork. So if you are worried about closed source miners, you might want to give the nevermore 0.1 miner a try and compile it from the source code yourself. Our initial tests show that the hashrate you get is pretty much the same with very small variation for either of the miners. There are also official pre-compiled binaries available for Linux and Windows (32-bit and 64-bit) compiled for CUDA 9.0, though do note that these do come with a 1% dev donation fee included as a means to support the developer. You can increase the percentage with a command line parameter if you want to show your support with a higher donation percentage as well. If you compile the miner yourself from source you can remove the developer fee altogether, though you might wan to consider leaving the small 1% developer fee at least for a while.